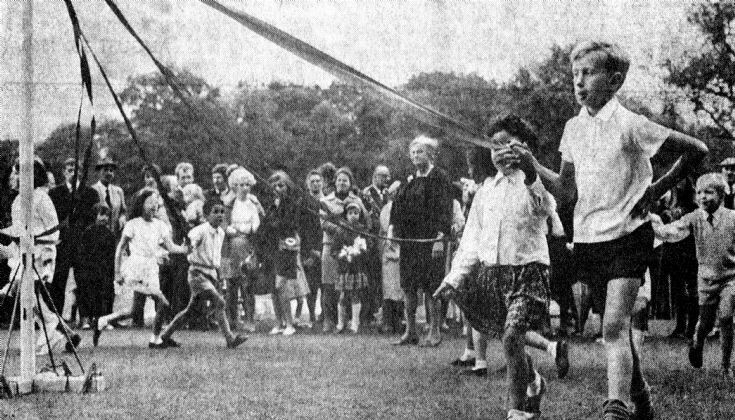 In 1969 the Handcross and District Band took its turn to organise a fete in the Recreation Ground, Handcross. A former resident of Staplefield, the Mayor of Brighton, Alderman Frank Masefield Baker was invited to perform the opening ceremony. Children from Handcross Primary School gave an exhibition of maypole dancing. Here they are seen dancing in pairs with a boy and girl at the end of each ribbon. Just to the left of the pair nearest the camera is their trainer, Mrs Lily Jakes, making sure nothing goes wrong. The Large Version shows the first part of the newspaper cutting. Select Open Document to view the second part of the newspaper cutting and the complete catalogue of the Handcross Flower Show and Fete for 21st July 1984.